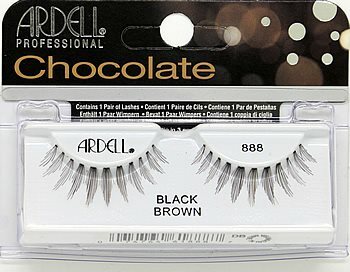 Ardell Chocolate Lash 886 features long full, spiky dark brown strip lashes mixed with black to create a natural, subtle effect. By mixing in black and using a bolder, darker brown, this lash makes more of an impact. Ardell Chocolate lashes are perfect for wearers who want a natural, but full, lash look. 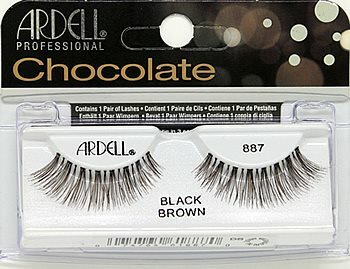 Ardell Chocolate Lash 887 features full and lengthy natural criss-cross brown strip lashes mixed with black to create a natural, subtle effect. By mixing in black and using a bolder, darker brown, this lash makes more of an impact. Ardell Chocolate lashes are perfect for wearers who want a natural, but full, lash look. 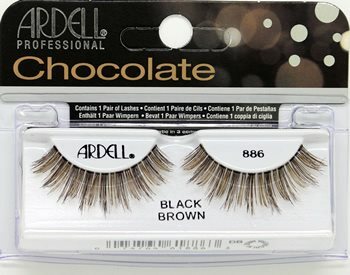 Ardell Chocolate Lash 888 features natural look yet simultaneously eye-catching brown strip lashes mixed with black to create a natural, subtle effect. By mixing in black and using a bolder, darker brown, this lash makes more of an impact. Ardell Chocolate lashes are perfect for wearers who want a natural, but full, lash look.